Jaguar Land Rover CEO Ralf Speth at the XE unveiling in London. The XE will face tough competition from cars such as the BMW 3 series but Speth says forecast growth in the premium compact segment means "there is space enough for everybody." The XE sedan marks Jaguar's return to the tough midsize premium segment it exited in 2009 when the brand stopped building the Ford Mondeo-based X-Type. The XE will launch in Europe next year and in the U.S. in 2016 with new engines, new technology and a new modular aluminum-based architecture. It will be Jaguar’s cheapest model, starting at 27,000 pounds ($44,000) in the UK. Jaguar Land Rover CEO Ralf Speth spoke with Automotive News Europe UK Correspondent Nick Gibbs and other journalists ahead on the car's unveiling in London on Monday. Is the XE the car that will make or break Jaguar? No one car can make or break Jaguar, but it will outperform our existing models because the price is more attractive. How important is the XE to Jaguar? Unbelievably important because it shows we can expand the product portfolio. We can cover more product segments and we will have the opportunity to bring younger customers and women to Jaguar. How will the XE win customers from rivals such as the BMW 3 series? It’s a powerful sporty car with a really nice driving experience, but it will also be a very cost-conscious car for businesses. It has low emissions and low fuel consumption. IHS Automotive predicts this segment [midsize premium] will grow 18 percent to 1.7 million by 2020 so there is space enough for everybody. Which will be key markets for the XE? The majority will sell in the UK, continental Europe and the U.S. We want to deliver the vehicle to all the markets where we sell Jaguars. You have added annual capacity of 168,000 units at your Solihull, England, plant for the XE range. When will this be reached? We have a very flexible bodyshop. We don’t intend to use the maximum capacity for one product. We probably need three vehicles to get to 168,000. The XE is underpinned by JLR’s new aluminum-intensive platform. How many different models will you build on the platform? An SUV, as reports have said? The number of models are unlimited, everybody probably knows what vehicle we should do next. But we don’t have the opportunity to conquer every niche and segment simultaneously. Are you aiming for similar levels of profitability as BMW, Audi and Mercedes? We want to be profitable. We have a good opportunity to achieve a similar level with our smaller products, but we don’t have the same economies of scale. I think we are not in bad shape. 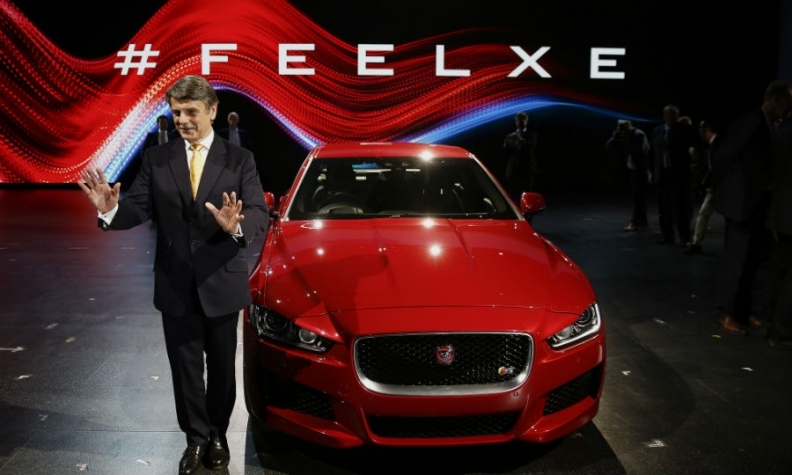 Will the XE have the same profit margins as other JLR vehicles? The XE will attract new customers who will climb the ladder of the product portfolio, so we can achieve very sufficient margins with the XE. It will have a quite nice profitability, but margins might be a bit lower [than other models in the Jaguar lineup]. The XE architecture is 75 percent aluminum. Is this an expensive choice? Aluminum has two major advantages -- one is stiffness, and the second [light] weight. In terms of real-world fuel consumption but also emissions, weight makes a difference. We also have a long history in producing and developing aluminum bodies that we wanted to continue.